Scotland was awesome. We spent about a week and a half in Scotland and 7 days of that was spent doing a 7 day, Best of the West tour with MacBackpackers. We weren’t sure what to expect of the tour and to be honest we booked it so long ago we really didn’t remember what we were going to be doing. We flew into Edinburgh the afternoon before the tour started and stayed the night at the hostel where we would be picked up in the morning. MacBackpackers is a budget tour group, so we spent all of the nights on the tour in a hostel, and had the option of cooking for ourselves instead of eating out. 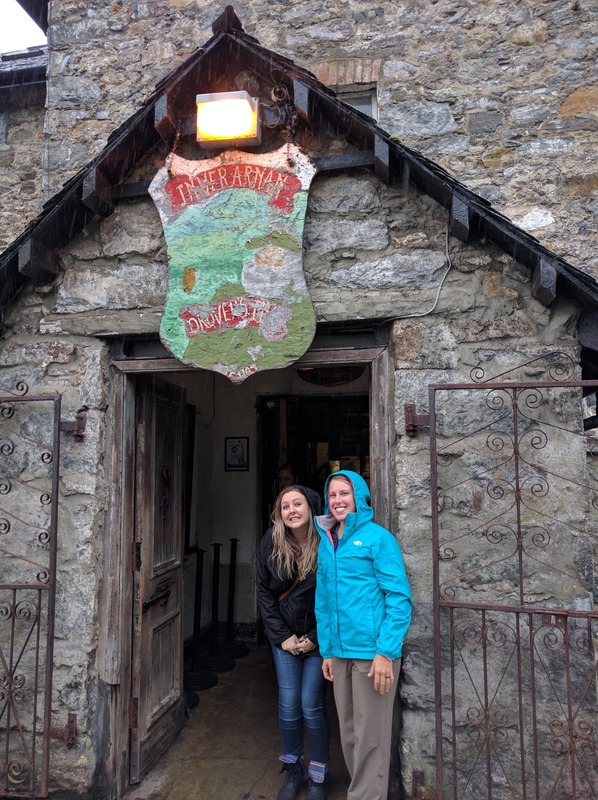 It saved our wallets a little bit, and the information and places that our tour guide took us were places we would have never stopped at if we were doing ourselves- totally worth it! The first morning or our tour, July 4th, we met our guide, Graham, and the 11 others we would be spending the next week with. We didn’t know what to expect, but our group turned out to people of a variety of ages and traveling from a whole lot of locations, some just on holiday, a retired couple, and a few jobless travelers like us. It was great getting to know everyoneover a week and it was nice to make some new friends! The first day we stopped in Dunkel to buy lunch and walk around a ruined chapel and then ate our lunch near a loch in the biggest national park in the UK. We spent some time that afternoon at the fields where the battle of Culloden took place and explored the great museum there before heading up to Loch Ness and going for a swim with Nessie and then heading into Inverness to settle down for the evening. The second day saw us off to Corrie Shalloch Gorge and taking a ferry over to the Isle of Lewis. That day we had lunch on a gorgeous beach and saw a pretty cool lighthouse on the cliffs along the coast. We stayed the next two nights in traditional black houses (thatched roof and all!) and cooked communal dinners, which we great for everyone to spend some time getting to know each other over a hot meal. We spent the third day climbing around a Scottish Broch, walking among standing stones they think were placed about 4000 years ago (that’s right, 3 zeros… super old!) that are second only to Stonehenge in their age and size, and then hiked across a ridge in the rain to see some of the country side. We lost a member of our group during the hike and had an hour or two of excitement trying to figure out where he went, but eventually we all made it back together. Day five we hopped another ferry back to the mainland and had a great hike that finished under the iconic bridge from all the train scenes of Harry Potter, as they go back and forth to Hogwarts. We stopped in Glencoe to hike near the ‘3 Sisters.’ It was an area of the family Campbell disgrace and was on of the most gorgeous places we have ever been. The river valley is so lush and green, and the water is fresh from all the rain and filtered by the volcanic rock, so I hiked up one of the hills and filled a water bottle straight from the stream. This was our favorite stop of the tour and we’ll be back sometime to do a lot more hiking and exploring. Day 6 was a free day to explore Oban, and we spent our time touring the Oban Distillery and going to the free museum in town chronicling Scotland’s military and some of the local history. That evening we got a massive serving of fresh fish and chips from one of the many local vendors, and it was fantastic! Day 7 saw us to Campbell Castle, a quick pit stop in Inveraray, Loch, Lomand, and lunch at a pub that has been around since 1705. We also made stops at Doune Castle and Stirling Castle, before heading back to Edinburgh and getting dropped at the same hostel where we started the trip. We spent a few more nights there, so we’ll be posting another blog diving into a few of our favorite times in Scotland as well as the last few days we spent in Edinburgh. Castles seen: Too many to count!